Our Amish Parsons Chair with Straight Top is handcrafted in America with a Parisian influence, evoking a classic style. Parsons Chairs were designed with traditional influences in mind that benefit a modern home. Create a look of timeless elegance in your dining space that will be an enduring influence on all of your special occasions. True chameleons, our Parsons Chairs offer unmatched versatility. The Parsons chair was originally designed to offer a simple, functional and comfortable chair that blends well with any room decor. They make perfect accent pieces at the head of your table, and also look great as a full set. We love them upholstered in premium leather offering superior comfort at every meal. Soft back foam conforms to your back while the elastic webbing offers all the support you need. No matter which options you choose, the simple details of these chairs will be sure to shine through. 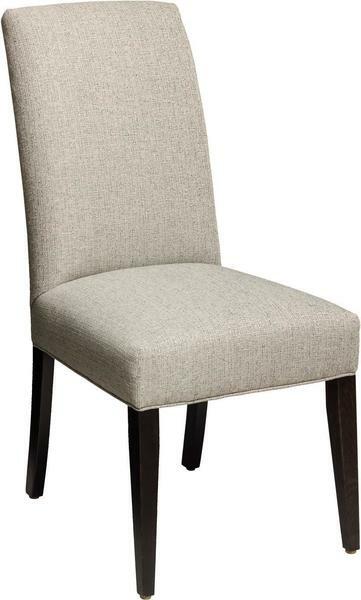 This dining chair is pictured above in brown maple wood with Cream upholstery. Brown maple wood displays a dark stain with grace and beauty, offering a uniform grain that works well for a smooth finish. View our Amish Parsons Arched Top Side Chair for a similar look with a slightly adjusted detail.